Lead assignment rules allow us to automatically assign Leads to the appropriate queue or user. A Lead assignment rule consists of multiple rule entries that define the conditions and order for assigning cases. From a Salesforce User interface, a user can trigger assignment rules by simply checking the Assign using active assignment rules checkbox under the optional section. 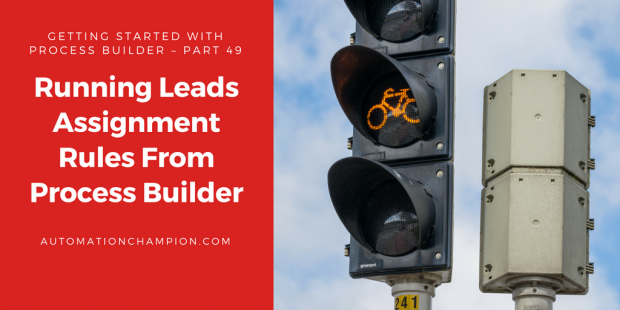 The problem arises when you need to insert or update the Leads from Process Builder and wants to trigger assignment rules. Using the Process Builder, a Lead will be inserted or updated but assignment rule will not be triggered as there is no check box to use the organization’s assignment rule or a prompt to assign using the active assignment rule. Let’s start with a business use case. Pamela Kline is working as System administrator at Universal Containers (UC). She has received a requirement a to update few Lead fields when Lead Source changed to Partner Referral. As data changed by the process, she wants to fire the assignment rule as soon as Process update the lead record. There are few possible solutions for the above business scenario, but I’ll use Apex and Process Builder to solve this. Before proceeding ahead, you have to understand Database.DMLOptions in Salesforce. When no other process action can get the job done, add customized functionality to your Salesforce processes by calling an Apex method. To call an Apex method, add Apex action to your process and select an Apex class with an @invocable method Annotation. It allows us to extend the Process Builder by writing Apex code that meets certain criteria and then invoking the Apex from our Process. If the class contains one or more invocable variables, manually enter values or reference field values from a related record. @InvocableMethod Annotation support bulk operations. Now, we have to understand a new Apex annotation i.e. @InvocableMethod. This annotation lets us use an Apex method as being something that can be call from somewhere other than Apex. The AssignLeadsUsingAssignmentRules class contains a single method that is passing the ids of the Leads whose Lead Source changed to Partner Referral. Create the following class in your organization. The above class will work in all the scenarios, so don’t modify it. Follow the below instructions to create a Process for the above business requirement. 2. The next step is to add entry criteria. For this click on Add Object, select Lead object and for the entry criteria, Select when a record is created or edited, as shown in the below screenshot, once you are done click on the Save button. 3. The next task is to add Process Criteria, To do this click on Add Criteria, enter Name, Type of action and set filter conditions (In this case set [Lead].LeadSource Equals Partner Referral as shown in the following screenshot. Make sure to select the checkbox Do you want to execute the actions only when specified changes are made to the record? 4. The next step is to add an Immediate action to Process. Click on Add Action (Under Immediate actions), Select the type of action to create (In our case Record Updates to update the Lead fields), and then fill out the fields to define the action, as shown in the following screenshot. 5. Because of trigger and order of execution, the next task is to set the time for scheduled action (Apex). For this click on Set Schedule available under Scheduled actions. Set time for scheduled actions as shown in the following screenshot. 6. Now we have to add a Time-based action into the Process to execute Apex. For this select action type Apex, Use Field Picker to choose the field [Lead].Id, as shown in the following screenshot. Under Apex Class section, It will list out all the classes that contain methods annotated with @InvocableMethod Annotation. 7. Once you are done, click on the Save button, it will redirect you to Process canvas. Finally, the Process will look like the following screenshot. 1) Navigate to the Lead tab, identify the Lead record and click on Lead Name to open record detail page, as shown in the following screenshot. 2) Now update the Lead Source to Partner Referral, as shown in the following screenshot. 3) Now check out the Lead record, Lead Status and Rating field has updated by process builder, and there is no impact on Lead Owner, as shown in the following screenshot. 4) Wait for some time to let the execute the time-based action, and refresh Lead record again. Note: – I will suggest you implement this first on your developer org, test it and then move it to production. The same approach will work for case assignment rule. Download Apex and Test class from GitHub. Can you suggest if and how the Apex Code should change if my PB is triggered by a Task whose WhoID is a Lead (ie ID starts with 00Q)? Everything else in my PB works (e.g. changing the Lead Record Type). Yet my Lead Assignment Rules are not triggering. I only have one Rule Entry so it’s easy to tell it’s not triggering. As per the understanding, there is no need to modify the Apex class. Could you please send me an email (infoatAutomationChampiondotcom) with all the screenshots and I will take a look at it. First, make sure that Process is active and it fulfills the entry criteria. Second, please explain your use case in detail. We use Pardot with SalesForce. When the Pardot Score reaches thirty the lead is created with a status of “Prospect” and owned by a queue called Fishing. When a lead reaches a score of 100 Pardot updates the status to MQL (Marketing qualified Lead) but cannot run lead assignment rules. I created the Apex Class as above (copy and paste). Object: Lead – when a record is created or edited. Immediate action is left blank because we do not need to change any fields. Scheduled Action 0 hours after LastModifiedDate. For my test I had a Lead with a status of Prospect and in our Fishing “Queue”. I updated the status to MQL. Unfortunately Chris is NOT in our Lead Assignment rules, (Which are 5 Round Robins). Under Lead Settings we have Lead Queue Setting “The queue or user that will own a lead when assignment rules fail to locate an owner: *when a lead is saved with the auto-assign checkbox selected * when a lead is captured online. So somehow the lead assignment is not working and Chris is the Default Lead Owner. We have implemented the same for our Lead assignment rules, The problem was we were not getting any email notification. After activating the critical update,(Stop Automated Field Updates from Suppressing Email Notifications) we started getting the email notifications (multiple instead of one) and there are no email alerts other than this. Now the issue is we are getting 2-3 email notifications instead of one notification. Can you suggest something on this. Sorry, I have implemented this for execute assignment rule from process builder. Now from where these email alerts comes into the picture? I have implemented this on change of a number field on lead object, Lead type is changed. After this leads are required to follow the assignment rule as per the code I have used provided here. The leads setting up the right correct queue after update as lead owner, however, the leads are not getting passed on to queue members. Can you suggest on possible reasons. Make sure that there are no other process or trigger to reassign the owner. Use Debug Log to identify the root cause. This looks brilliant! I’m trying to do something similar when Lead Score turns 100 and the current user is Marketing User. Would the Apex Class have to change? Thanks! The answer is no, you don’t have to make any changes in Apex class. Never mind …i solved this error. Thanks a ton for this awesome Lesson! Your solution saved me a lot of time. Although can we reduce the invoking assignment rule any faster. or can we invoke the class as immediate action. This is great! However, once I’ve created the process, I can’t create a new lead. I get a “Workflow Action Failed to Trigger Flow” error. Is there anything in the new releases that requires any change to code? Can you please post the error email log here ? This helped me avoid creating leads where the owner was an inactive user. Why can’t I select the Apex class as an immediate action, instead of a Scheduled Action? Immediate actions lets you select Apex as a type of action, and why I try that… I get an error. It works perfectly as a schedule action, though. Hi Rakesh, this is explained very cleary. It’s great ! I tried that in order to trigger Case Assignment Rules. However, I’m always getting an error. In the Apex class, I substituted Lead by Case and Leads by Cases. Here is the error, If you have any idea? An error occurred at element myWaitEvent_myWait_myRule_1_event_0_SA1 (FlowActionCall). The following values from the event were assigned to flow variables. Can you please post the screenshot of your Process ? This is fantastic. We were in the midst of discussing a much more complex solution. Did the test class get published for this? Please check GitHub now for the test Class.